As you work on a project, you may find it useful to capture risks, track issues, upload files, and list deliverables on the project site. Sometimes, these risks, issues, files, and deliverables are tied to specific tasks within the project. By linking these items to their related tasks, you give yourself a reminder of where you need to keep an eye on things, or where you have files that you might need to refer to or keep updated. You can link things together by starting with the risk, issue, file, or deliverable, or by starting with the task. Click the name of the issue, risk, file, or deliverable, to view it. On the left side of the box, under the name of your project, click Tasks. On the right side of the box, click the row for the specific task (or tasks) you want to link the issue, risk, file, or deliverable to. Click Insert to link the item to the task. Add your project's risks, issues, files, or deliverables to the project site. In Project Web App, click Projects on the Quick Launch. Click the name of a project in the list. Click Project Site on the Quick Launch. Click Tasks on the Quick Launch. 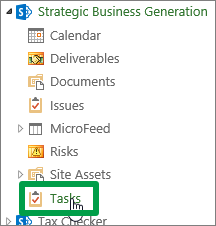 Click the name of a task in the list. 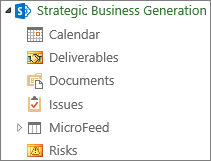 On the left side of the box, under the name of your project, click Risks, Issues, Documents, or Deliverables. On the right side of the box, click the row for the specific item you want to link the task to. Click Insert to link the issue to the task. If you're still not finding the answers you need, try searching for content on support.office.com, or browsing through the list of topics on the Project Help Center. You may also find it helpful to post your questions and issues on a discussion forum. The Project discussion forums tend to be very active, which make them a great resource for finding others who may have worked through similar issues, or encountered the same situation.